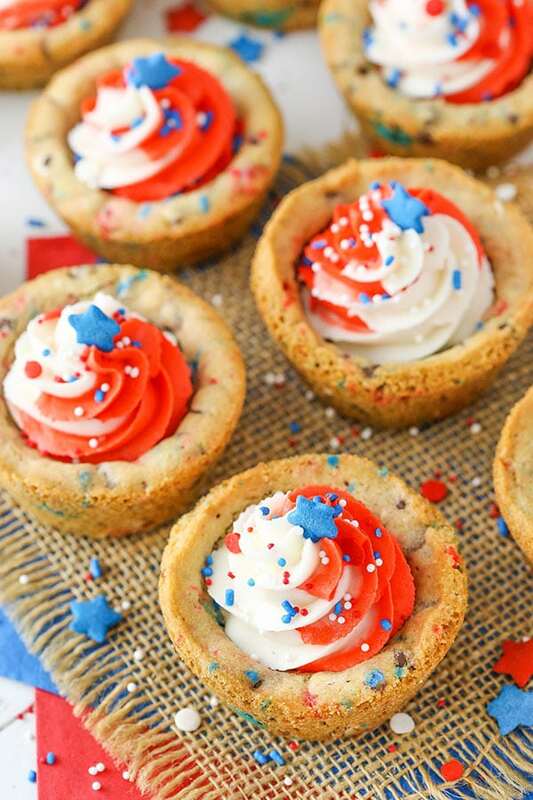 These Patriotic Chocolate Chip Cookie Cups are so festive and fun for the 4th of July! They are soft, chewy and full of bits of chocolate! 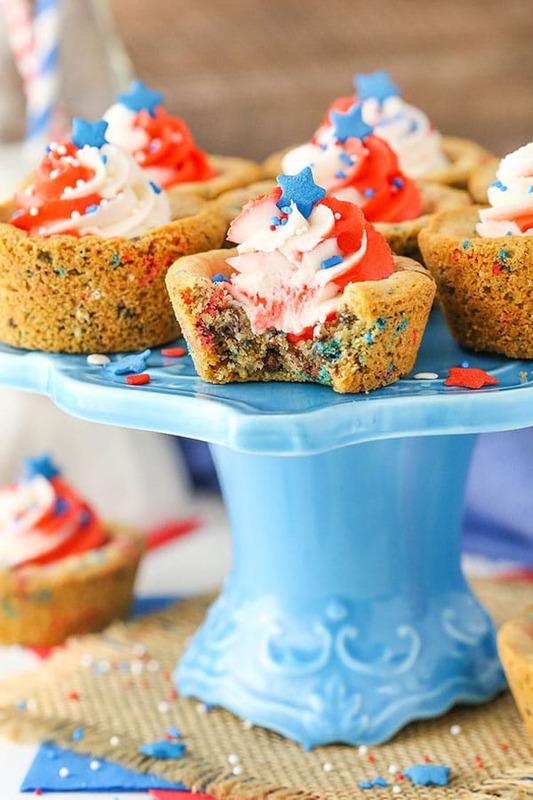 The swirled frosting and fun sprinkles make them perfectly patriotic! So this past Friday, we officially had our IVF transfer. Now we are in the waiting period for 10 days until we find out if it was successful or not and if I’m pregnant. Per doctor’s orders, I took it super easy over the weekend, with my mom and the hubs pretty much waiting on me hand and foot. While it feels a little silly and I’m not at all good at sitting still for any long period of time, I listened and did what I was told. If for no other reason than for my sweet husband. He’s taking stellar care of me and he so badly wants this work (as do I). I’ve got to chill simply so he has piece of mind. And to be quite honest, as hard as it is, it feels like the right thing. It was somewhat fitting that yesterday was Father’s Day, given the current situation. While it’s not exactly official yet, the hubs has taken on the role of father as much as he can at this point. Making sure I’m taken care of – and therefore the little (hopefully) baby-to-be. He’s even started talking to my belly already. It’s sweet and funny all at the same time. I am so hopeful that this time next year we can truly celebrate Father’s Day. But of course the end of one holiday signals another one on the horizon. The 4th of July will be here before we know it! 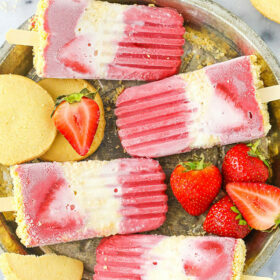 I don’t know about you, but if I’m all clear I hope to be in the hot sun on the lake with cute patriotic treats in hand. 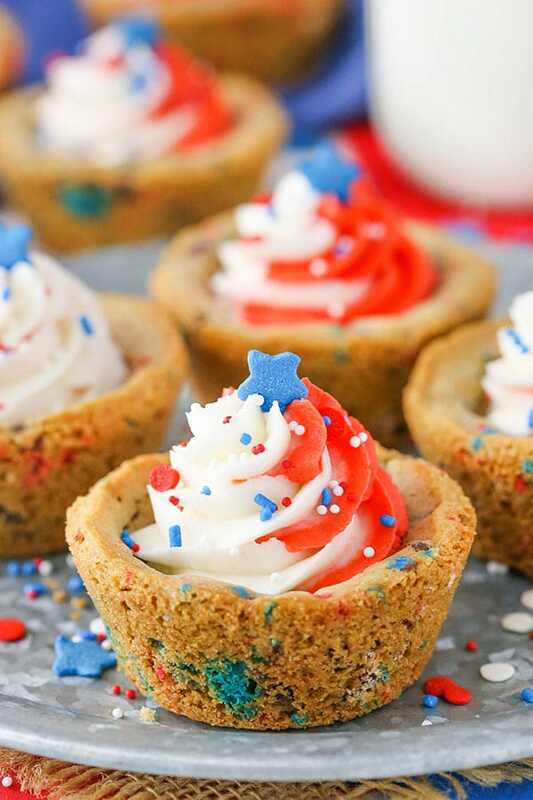 If you too are a fan of festive treats, these little cookie cups are perfect! The cookie cup itself is super soft, as long as you don’t over bake them. It can be really tempting to bake them for longer when you take a quick peek at them in the oven, but as long as the edges are lightly golden and set, then center should be fine. You want it to look a little underdone because it’ll keep baking a bit as it cools and then firm up nicely. I like to leave the cookies in the cupcake pan until mostly cool too, so they are firmer when you remove them. They stay together more easily, without the centers falling out. 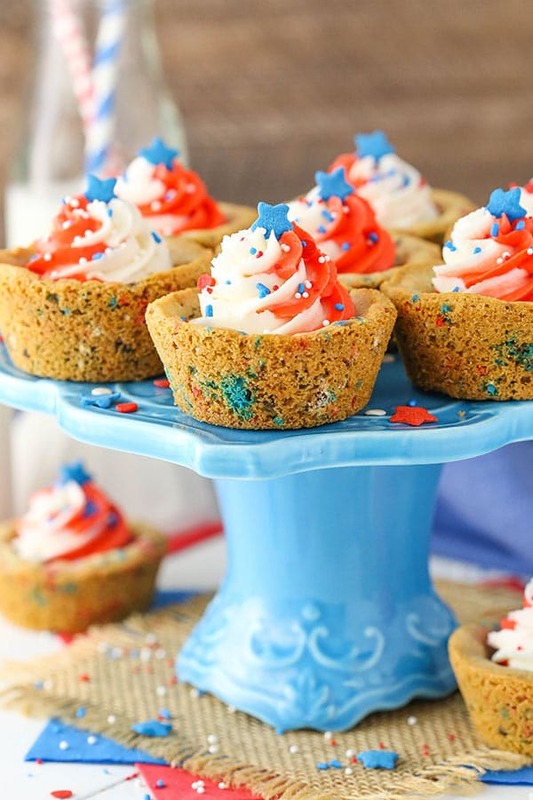 The cookie cups are filled with a tasty vanilla frosting. 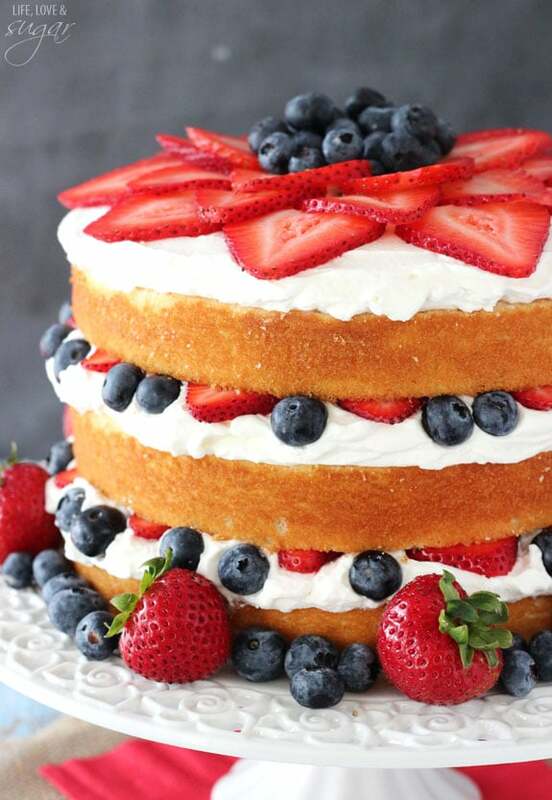 Creating the swirl of red and white really is simpler than it may seem too. Just color half of the frosting red, put the two colors each in their own piping bags, then put them both in one larger piping bag and pipe it! Finish the cookies off with some fun sprinkles and you have a super easy and totally festive treat that will definitely be a hit! Who doesn’t love a classic chocolate chip cookie all dressed up for the holiday? 1. Preheat oven to 350°F (176°C). Spray a cupcake pan with non stick cooking spray. 4. Combine the flour, baking soda, cornstarch and salt in a medium sized bowl, then add to the butter mixture. Mix until well combined and a dough forms. 5. Stir in the chocolate chips, M&Ms and sprinkles. Dough will be thick and a bit sticky. 6. Makes balls of about 2 tbsp of dough. 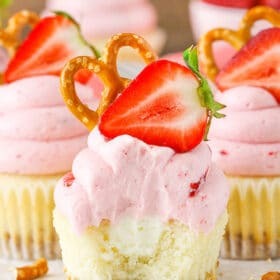 Press cookie dough into the bottom and about 1/3-1/2 way up the sides of each cupcake cup, forming a cup shape. 7. 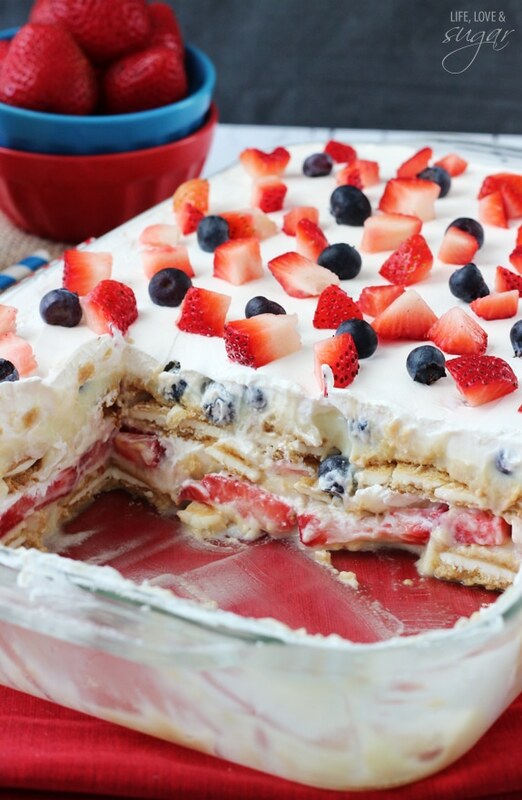 Bake for 10-12 minutes, or until edges are just golden. If they look a little undercooked in the center, that’s ok. They’ll continue to bake as they cool and firm up. 8. Remove from oven and allow to cool mostly in the pans, then remove to a cooling rack. If the centers aren’t cupped enough, use the bottom of a tablespoon to press the center down a bit while still warm. 11. Add the vanilla extract and 1-2 tablespoons of water or milk and mix until smooth. 12. Slowly add the remaining powdered sugar and mix until smooth. Add additional water or milk, as needed. 13. 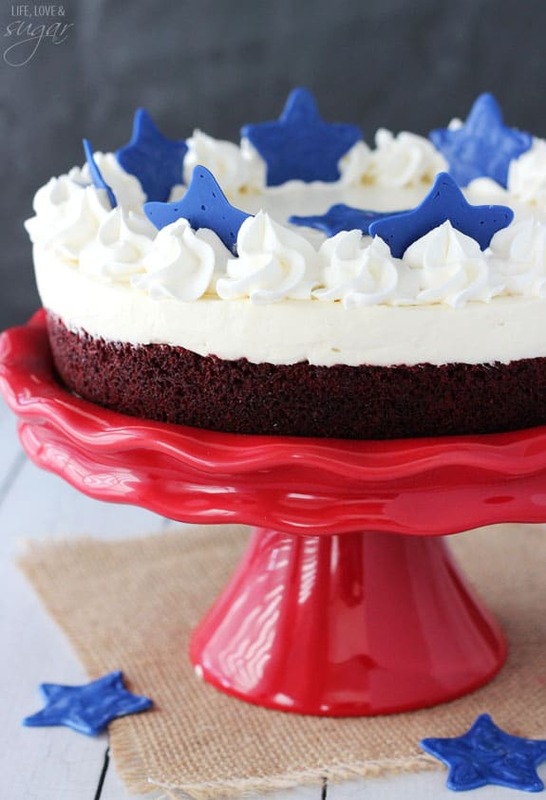 Split the frosting into two bowls and color one bowl with red gel icing color. 14. Put the two colors of frosting into two separate smaller piping bags, then put both piping bags side by side in a larger piping bag fitted with a piping tip. I used Ateco tip 844. 15. 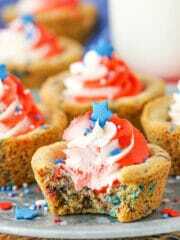 Pipe the frosting into the cookie cups and top with sprinkles. Thank you very much dear ???????????????????? well done ???????????????????????????? 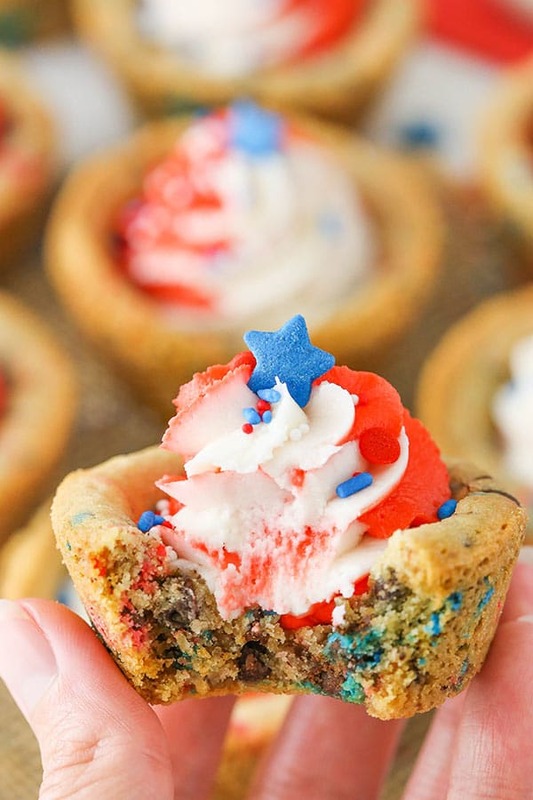 These cookie cups look amazing! Perfectly bite-sized too so you won’t feel so bad eating them all! Lindsay, praying for you and your growing family!???? Praying for you and sending lots of love to you guys right now! 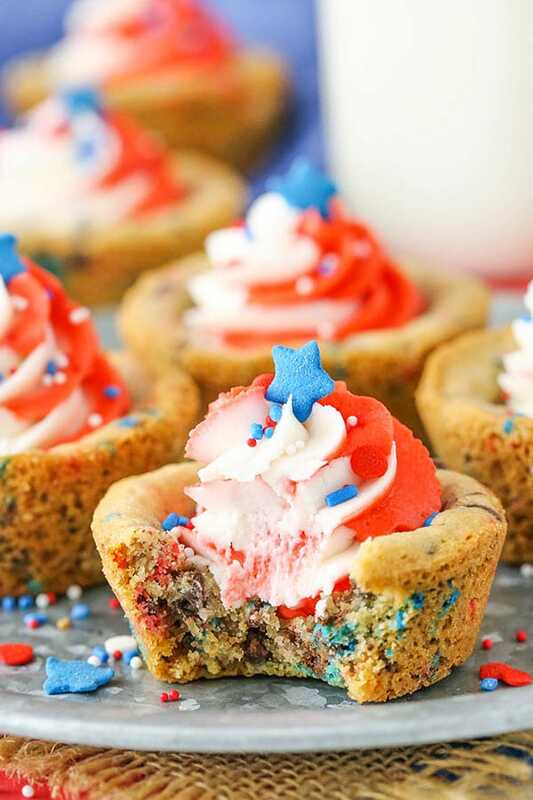 Also, I can’t wait to make these Chocolate Chip Cookie Cups! ????❤️??? ?❤️ You are awesome! ???? The waiting after transfer was the HARDEST part, I found. Sure the needles, meds and procedures aren’t exactly a picnic, but it’s the 10 days until your blood test that seems to just drag on for years!! I’m keeping all my fingers and toes crossed for your success. And thanks for the great tip about how to pipe multi colours at once without a big gluggy mess, brilliant! I have been thinking of you a lot recently, particularly when I look at the photos of my stunningly beautiful grandnieces; all successful IVF babies. We are praying for you through the waiting period, confident of EVERY promise He made. Loving your videos – which give me confidence to try new things. Loving your photography – which highlight the value of both look and cook. Enjoying rocking, new props. Just a quick visit to your site makes me smile every time. If I try something, the hubs really smiles! Thank you so much – for the prayers and the sweet words about the site! So glad you enjoy it! Best of luck with the IVF. I was there 13 years ago. I have 12 year twins, a boy and a girl. 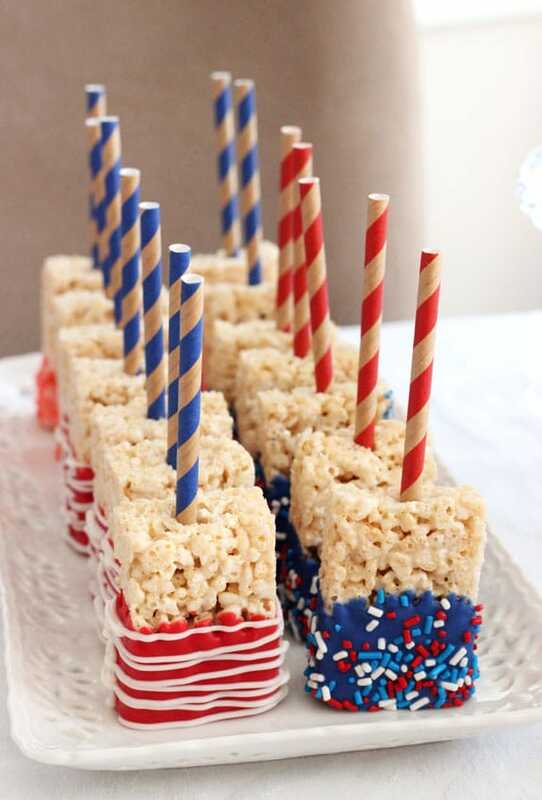 I made these for my birthday on the 4th of July and we didn’t like the shortening taste in the frosting so next time I would make the frosting all with butter. Plus, piping the 2 colors of frosting didn’t work for me either. I probably won’t make these again. I love all of your recipes, you have been my go to recently. 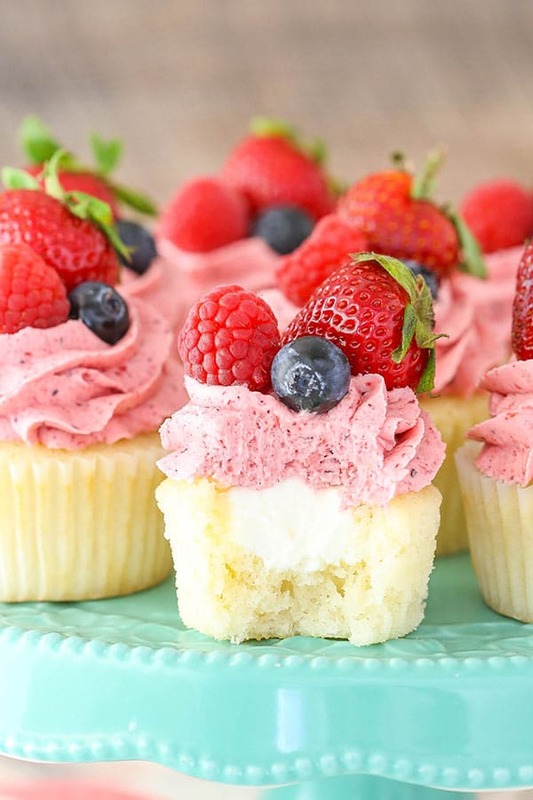 Have you made these using a mini muffin pan? If so, how long would you bake them?